The Euro dictatorship in Brussels has their deep state candidate running in the French Elections, Mr. Emmanuel Macron -“ni” or “nyet”? The question is, “What do French citizens want?” Do they want to lose their cultural identity, their social programs and social reforms through EU dictates and austerity or do they want to save their cultural identity and their way of life by returning to a national state of economics? 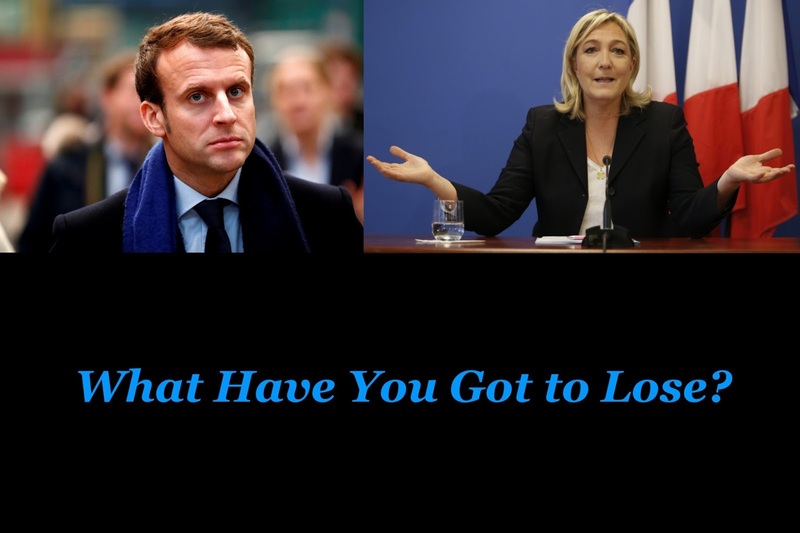 If Macron wins this high stakes poker game, France will be history… the people of France will lose everything they've gained socially and go down the path of an EU bankruptcy…a bankruptcy filled with austerity that will continue to rip France apart and bleed jobs away from the country the way they did to Greece…and of course, we must not forget that the EU also has a belligerent US economic foreign policy driving it. The USA does NOT like Socialist countries and is doing its best to destroy every single one of them…that is one of the reasons why the EU was created in the first place…to end European Socialism. The French and European Deep State are warning of an economic catastrophe if Marine Le Pen wins the French election in May 2017…yet in reality, no matter who is elected, the economy is going to crash anyways. But if France wants to save itself, then they should circle the national wagons and protect their culture and way of life. France needs to drop out of the Euro to regain its national sovereignty if they are going to survive down the road when the European Union crashes under deeper austerity measures through the American economic de-socialism agenda. In fact, I would warn the people of France that if they vote for Macron, they will lose their nation to wealthy speculators in a privatization blitz that will leave the people of France impoverished without their social and health programs, which of course will be whittled away under Euro austerity and deep budget cuts due to having to “Borrow” its budget money with interest to provide the goods and services the country needs. And what has Brexit (a capitalist Brexit) brought to the working class of Britain? All that Le Pen is doing is bargaining for bigger piece of the pie for certain sections of the French bourgeoisie. She is talking about pulling out of EU treaties and not out of the EU anyway. This is double talk so she can adjust later. Similarly with NATO. She talks about pulling out of the "integrated command" of NATO and not out of NATO. More power in other words for France. Endo Imperialist games. No to both is the answer. "La Peste ou le Cholera". Out of the EU and NATO with socialised means of production..
La peste ou le cholera; Macron or LePen? None of them! I don't want to share LePen's speech-video, this is more than enough: Marine Le Pen calls for Mosque closings and the elimination of Muslim Brotherhood in France. Make France Great Again VOTE Le Pen – Anna R.
An example of her demagogy is her position regarding the Euro. "The Euro is dead", she says. Giving the impression she is anti EU. Then she clarifies that the aim is to use the Franc for internal purposes but the EURO for external trade. Now how she will do that and not be in the EU only Varoufakis knows. Look at her other positions also (not her tweets). Exit from NATO? NO. Just the integrated command (whatever that means)? Double talk again. Second, returning to the French Franc with a National “PUBLIC” central bank is EXACTLY what France needs to do, in order to regain their nation back from financial predators…ie: the Private Bankers and their majority shareholders. As it stands now, France “BORROWS” its budget money “the EURO” with compound interest and will never escape financial debt IE: Economic Dictatorship from the private ECB. The only way to escape the mounting debt and austerity is for the French government, who is responsible to the people, is to issue debt free currency for their own national budget WITHOUT outside interference. This practice was done in Canada between 1935 and 1974 and we did not go into debt but instead experienced growth and built a strong nation during those years. Third, dealing with other countries in trade with the Euro is not a problem because that is how you deal with other EU members who adopt that currency…the UK for example uses the pound but trade in the EURO with European countries…there’s no problem with using the currency of trade within the EU while using your own national currency…currency reserves are used for that purpose. When the Federal Reserve who is the creator of money alongside IMF keep on rising the debt ceiling like there was no roof on top, the rest are submitting currencies to the US$. A trillion in debt for Canada is an exaggerate but we are heading that way... why... we introduce carbon taxes while Trump champions for coal, what a joke, as we dare throw numbers at each other as though we know what's what, look at the big picture and you should understand. Where was France before Euro, economically it has been Germany who has held Euro in place but France in many other ways was supportive, should Europe not survive who's going to pick up the pieces with the German elections ahead. Those are major players in the World scale, the indication is we are entering an authoritarian age, when the majority inclined to that, this suits some people I bet, nothing less than free is good enough for me. The elitists are on both side of the fence, Le Pen also has elites in her bag, just different tags, but all the same elitism also befits nationalism. People can either give up and side with Macron or even not cast a vote, or they can fight...and if Le Pen does not do what she promises, then it will be up to the people to have a revolution...I think its better to reclaim ones nation by peaceful means and with a well informed public...so voting Le Pen seems to me the only choice France has to survive.